Most people are initially drawn to Marrakech for the exotic sights and sounds of its famous souks, but a retreat from the frenetic energy of the Medina (defined as the walled, ancient part of the city) is what you will crave after a couple of days of wandering its maze-like pathways. And that’s where spa-going comes in! Morocco’s long history of public bathing in traditional hammams – which include scrub downs and massages – has created local therapists who are naturally suited for caring for others and providing a real, personal touch. This generosity of spirit permeated the atmosphere of all the Moroccan spas I recently visited. 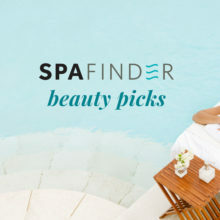 As a spa-goer, you’ll be spoiled for choice in and around Marrakech, but two of the most well-known spas – Es Saadi Palace Spa and La Mamounia – are within walking distance of one another and just a stone’s throw from the most impressive tourist spots the Medina has to offer. 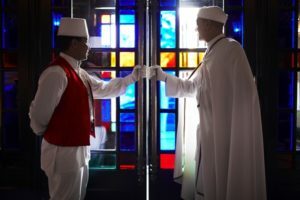 Es Saadi literally means “the contented one.” I wanted to discover if the new Es Saadi Palace Spa made good on this promise – plus, the opportunity to sample the high-tech beauty treatments of the first Dior Institut, located within a spa, was impossible to resist! Since 1966, this Moroccan palace, located on 20 acres of gardens just outside the Medina walls, has been serving celebrity royalty, including Mick Jagger, Princess Margaret and, more recently, Leonardo DiCaprio. 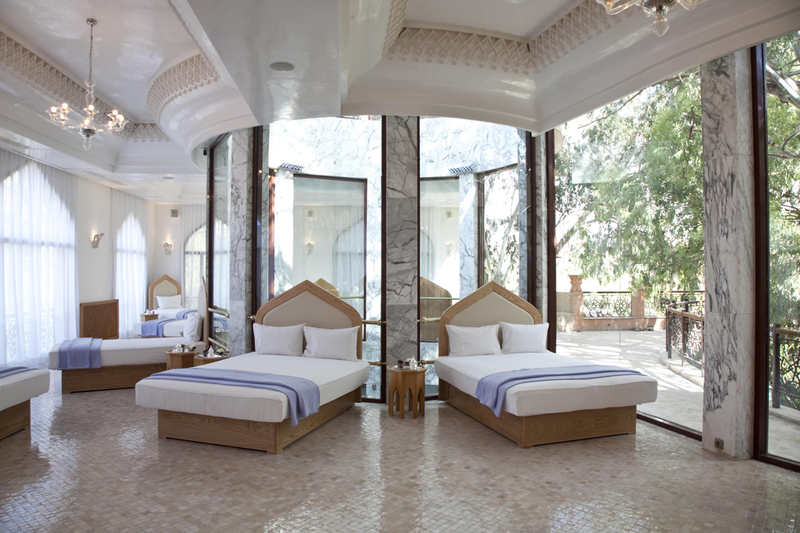 At Es Saadi Palace Spa, you’ll find fourteen treatment rooms, two of which are dedicated to Dior therapies. But you’ll also be able to visit an in-house hair salon and makeover studios. 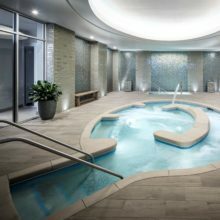 The 32,200-square-foot spa is built around a 100-year-old eucalyptus tree and wherever you are – in the pool, the relaxation room or visiting the amazing Oriental Thermae (a journey of dry and steam heat baths combining color, music and aromatherapy) – you have a view of this iconic image of renewal. Another not-to-be missed feature is the Sky Spa, a 10,000-square-foot terrace that offers views of the city walls and the Atlas Mountains! Inside Es Saadi, “The Blissful” four-hands massage lived up to its name. Described as a “surprising ballet that will plunge you into the third dimension,” it was absolute bliss. But probably the finest moment was when my Dior facialist, Nadira, told me my skin was “perfect.” Impossible, but lovely to hear (and a unique experience for me, as I’m usually told I need to buy a new product and to basically “try harder” with my skin). It made me leave feeling and looking fantastic. If you’re looking for something decadent, indulge in a “Full Day in Dior”: a two-hour signature facial; 75-minute beautifying hand treatment and 90-minute body treatment – all designed personally for you! Just inside the city walls sits the city’s most iconic hotel, La Mamounia. Walking up its garden path and into its great entrance, it’s easy to see why frequent guest Winston Churchill pronounced simply, “This is a wonderful place, and the hotel is one of the best I have ever used.” As the winner of both the 2010 and 2011 SpaFinder’s Readers’ Choice Award for “Best in Morocco,” it’s clear that spa-goers also think La Mamounia is wonderful too! Enter the hotel’s gilded halls and be swept away to a time gone by. Even though the hotel and spa recently underwent an extensive three-year renovation, it has retained every ounce of its original Moroccan history and design. In fact, you could be forgiven for thinking the hotel has been preserved in shrink wrap since its opening in 1923, but it’s actually had several overhauls through the years, the most recent doubling its room capacity to 210. This is a hotel full of infinite pleasures – including four magnificent restaurants (two of which are presided over by Michelin-starred chefs) and five bars – but what makes this property wholly unique is an incredible outdoor pool that is lined with Venetian tiles and sits in the middle of its fabulous 17-acre garden. Add the award-winning 27,000-square-foot spa and you have a recipe for delight. For those who can’t afford to splurge on a stay at La Mamounia, don’t despair! Day passes are on offer that include not only the use of the amazing hotel facilities (I lounged by the glorious swimming pool, but you could opt to play tennis or work out in the state-of-the-art fitness pavilion), but also lunch at one of the celebrity-chef restaurants and a one-hour treatments at the spa! Just the ticket for a shopped-out body and mind, at an incredibly reasonable $170. Making the way to the spa, the halls are lined with shops from Gucci, Prada, Chanel and Christian Dior, setting the scene for the luxurious experience to follow. 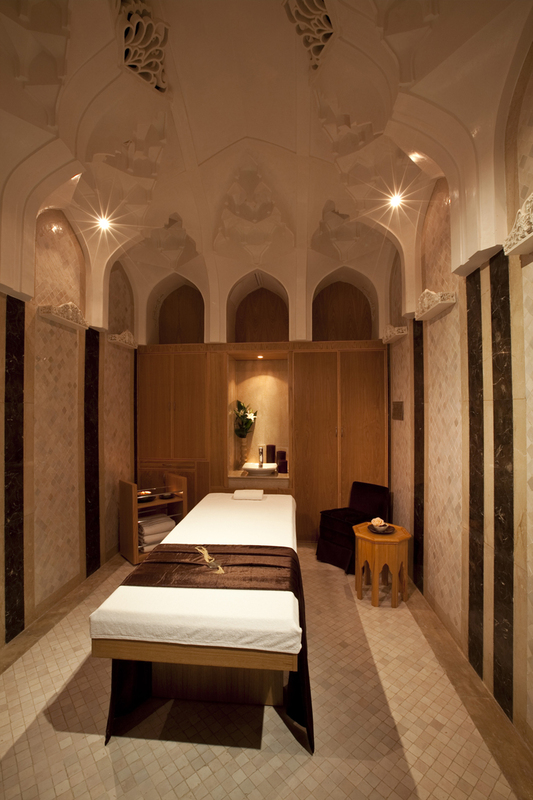 The spa itself is another testament to La Mamounia’s fusion of traditional with the very modern. 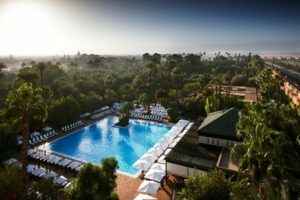 Over 80 treatments are offered, ranging from traditional Moroccan hammam treatments with marocMaroc to a full line of face and body treatments by Shiseido. I chose a purifying hour-long Shiseido facial, which was so relaxing that I fell asleep almost as soon as it started and awoke feeling refreshed and ready for the Marrakech night life. My traveling companion opted for more traditional fare and couldn’t stop enthusing about her first hammam experience and the connection she felt with her amazing therapist. All in all, Marrakesh is certainly magical, and its welcoming spa culture is not to be missed!